This post contains affiliate links. See our Disclosure Statement for more information. We just celebrated my youngest son, Benajmin’s, first birthday and went with a Horton Hears A Who Birthday Party theme! Horton Hears a Who isn’t a super popular Dr. Suess book, compared to some of his others, but our reasoning for choosing it as his theme was a little bit different. See, our son was born with a form of dwarfism called Achondroplasia. It’s the most common form and we’ve been extremely lucky that he hasn’t had most of the common issues other children with the same condition have. Since about mid-pregnancy, I have been obsessed with elephants for him. I choose all his room decor to be elephants, and we’ve ended up with tons of toys and clothing with elephants on them. We didn’t get his diagnosis until after birth, and within some of the dwarfism groups we joined, heard the quote, “A Person’s A Person No Matter How Small.” A quote from a Dr. Suess book who’s main character is an elephant. How crazy is that? We live by that quote now, and that’s how we ended up choosing to do a Horton Hears A Who Birthday party! I made the birthday banner myself using scrapbook paper that had orange and blue colors mixed in. One of the blue papers also has an elephant design on it. I seriously just got lucky that I already had all this on hand. I cut the squares to approximately the same size and cut out the letters using my Cricut. I then used Glue Dots (the best invention ever!) to attach the letters and then taped them to a string. I just mixed up the patterns of the paper before attaching the letters to make sure there weren’t two of the same next to each other. Because I am all about food, I was probably a little too ambitious with the cupcakes. We had white, vanilla, and chocolate cupcakes topped with either orange, blue, or gray icing. I attempted to make the gray icing look like an elephant trunk holding the pink flower with the “who” in it. I also found some edible icing cupcake sheets with Horton on them! All the decor was orange and blue and we had one Horton Hears A Who tablecloth and a pack of napkins (that I forgot to open!). It wasn’t easy (or cheap) to find Horton birthday items. I made gift bags for the children that attended and filled them with all blue and orange colored candy and toys! Poor Benjamin was being clingy to daddy all day and got super fussy right before cupcake time. I had not let him try anything sugary before and was really excited to see his reaction, but he was less than impressed. Then, the poor baby broke out into hives! We think it may be the dye in the icing and now have to see an allergist before introducing anymore new foods! The pictures of him look awful, therefore, I am not sharing them or he may hate me for life! Hopefully we can look back at this party one day and laugh…in nothing else, at least everything else came out looking good! 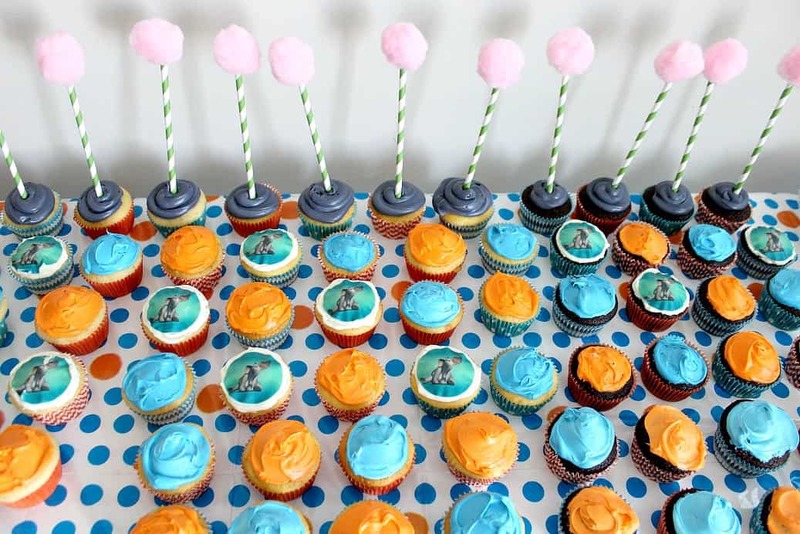 If you ever find yourself throwing a Horton Hears A Who birthday party, hopefully you’ll get some great ideas from this post! Love this. You did an awesome job. Going to show this to my nanny family. What an absolutely amazing job you did!! We love the movie and I think you really captured the colours. Those trees are fabulous! 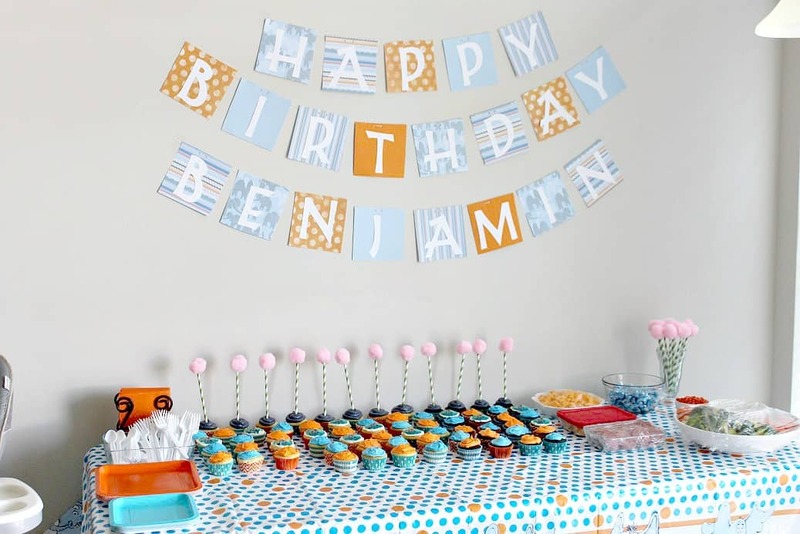 This is such a fun birthday theme… and the cupcakes! Brilliant! Thank you Tamara! It was fun to put together! Haha! Thank You Chrissa! I’d probably love planning other people’s parties! Thanks Samantha! I totally just got lucky with the paper I had on hand for the banner! I’m actually not throwing anymore parties (instead we are taking trips!) but I still plan to decorate and bake of course!! 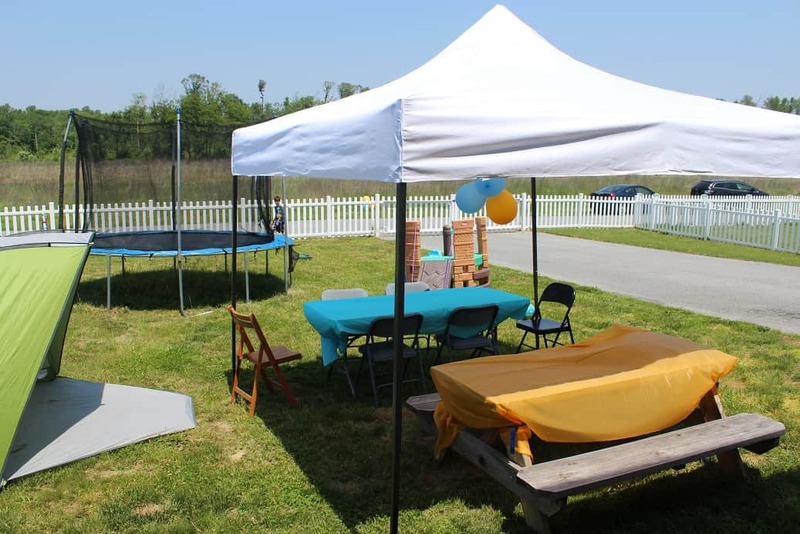 I love the theme you chose for your son’s party! It’s like it was meant to be, with the elephant and the quote- love that quote!- it’s too bad he broke out, but good thing you learned about the allergy sooner than later! Aww thanks Rachel! We actually just found out yesterday that it’s eggs he’s allergic to! Guess I need to learn how to bake egg-free cupcakes ASAP!